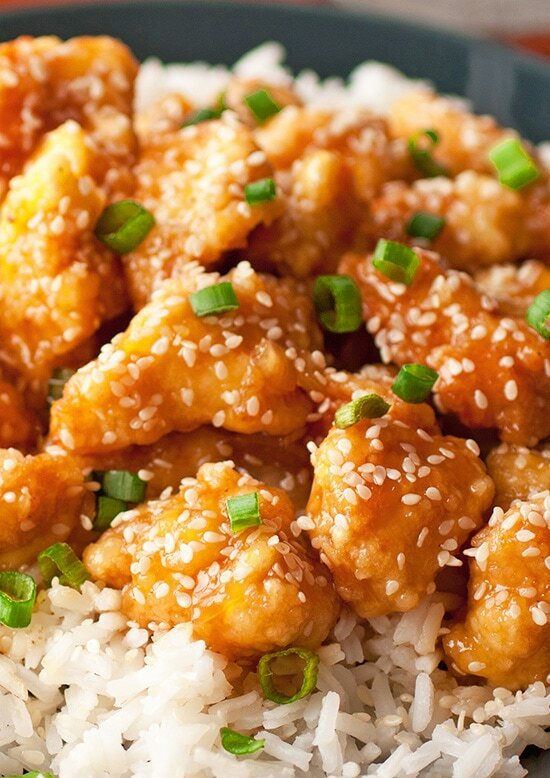 Honey Sesame Chicken is a Chinese take-out classic that’s packed with flavor! This homemade version is even better than what you’ll get at the restaurant and it’s a dinner everyone can agree on. 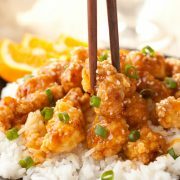 Bite size pieces of chicken a fried and tossed with the most irresistible sweet and sticky sauce. I’ve never really been completely in love with Chinese food, 19 times out of 20 I’d pick Italian, Mexican or all American pizza over Chinese food but my taste buds are really starting to crave it more lately. 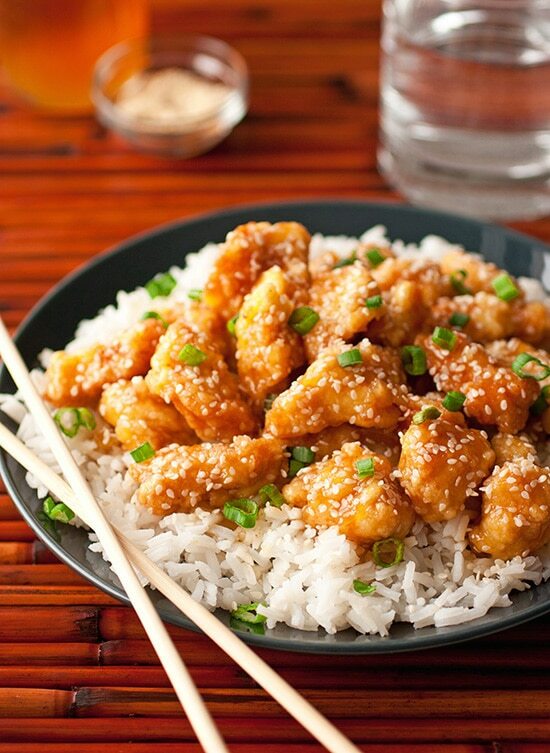 To be honest I don’t know how much a dish like this honey sesame chicken could really be considered a Chinese dish, it’s probably more of an American Chinese type entree. Either way, it is completely delicious. It definitely satisfies that craving for Chinese take out. If you’ve never used sesame oil keep in mind it’s powerful stuff so even though it’s just a few teaspoons a little goes a long way. It’s almost like an extract, its so potently flavorful. It has a very savory and deep tone to it with hints of smokiness. Once you taste it you may go, ahh that is what the underlying flavor of that tasty entree I had at that Chinese restaurant was that I just couldn’t quite put my finger on. How Can I Make it a Little Healthier? 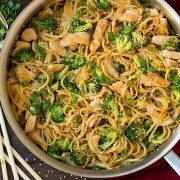 If you wanted to make this a bit healthier you could replace the whole eggs with 2 egg whites, reduce the cornstarch mixture to 1/4 cup as well as 1/4 tsp baking powder, then combine the cornstarch/baking powder mixture with the egg whites and toss the chicken into mixture, saute the chicken in a wok or large non-stick skillet with a few Tbsp of oil rather than deep frying in several cups of oil. Also, if going the lighter route you can cut the sauce recipe in half. Which ever you make it I hope you enjoy! 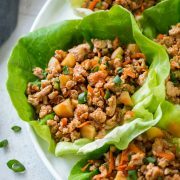 A classic Chinese dish that's packed with flavor! This homemade version is even better than what you'll get at the restaurant and it's a dinner everyone can agree on. Bite size pieces of chicken a deep fried and tossed with the most irresistible sweet and sticky sauce. In a small saucepan combine chicken broth, honey, soy sauce, sesame oil, vinegar, onion, garlic, ginger and season with salt and pepper to taste. Bring mixture to a boil, meanwhile in a small bowl whisk together 1 1/2 Tbsp cornstarch with 1 1/2 Tbsp cold water until well blended. Once mixture has reached a boil, whisk cornstarch and water mixture into honey mixture, then reduce heat to medium-low and cook stirring constantly until mixture has thickened, about 3 minutes. Remove from heat and cover with lid to keep warm. Pour vegetable oil into a large cast iron dutch oven, filling pot about 1 1/2-inches deep and heat oil to 350 degrees. Meanwhile, whisk eggs in a shallow dish until well blended. Pour remaining 1 cup cornstarch into a separate shallow dish, add in baking powder and whisk well to blend. Dip chicken pieces into egg followed by cornstarch and toss pieces to evenly coat in cornstarch. Carefully place 1/3 of the chicken pieces into preheated oil and cook for 5 - 7 minutes until golden, turning once during cooking. Using skimmer, remove fried chicken from oil and transfer to a paper towel lined cookie sheet to drain excess oil. Repeat process with remaining chicken working in two more batches. Pour drained fried chicken into a bowl and toss with sauce and sesame seeds. Serve warm over white or brown rice garnished with green onions if desired.